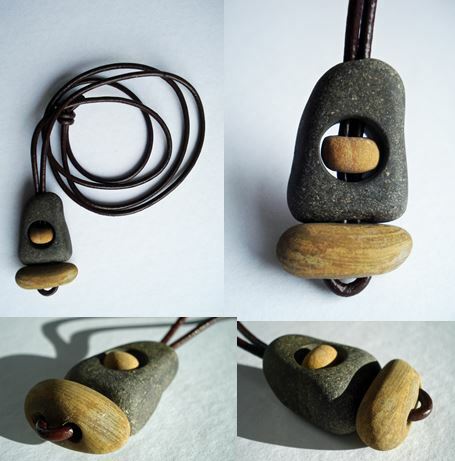 Click here to see all my stone pendants. 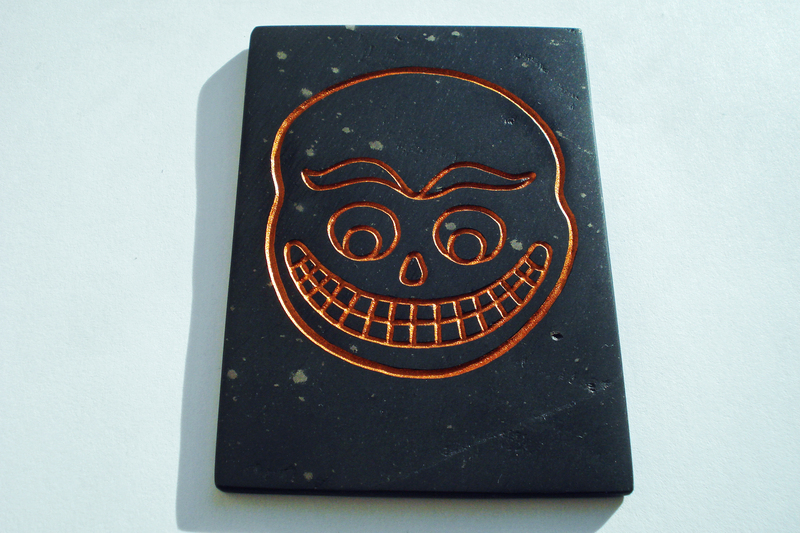 Click here to see all my slate tiles/wall plaques. 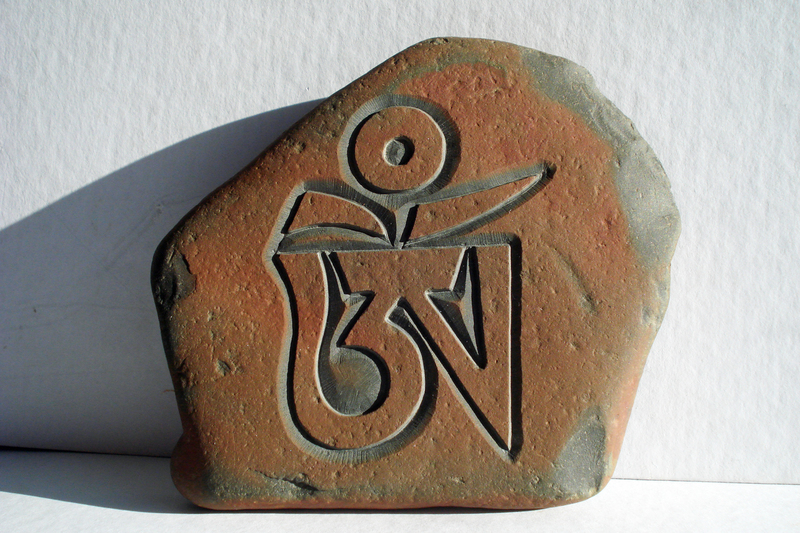 Click here to see all my Buddhist/Sanskrit stones. 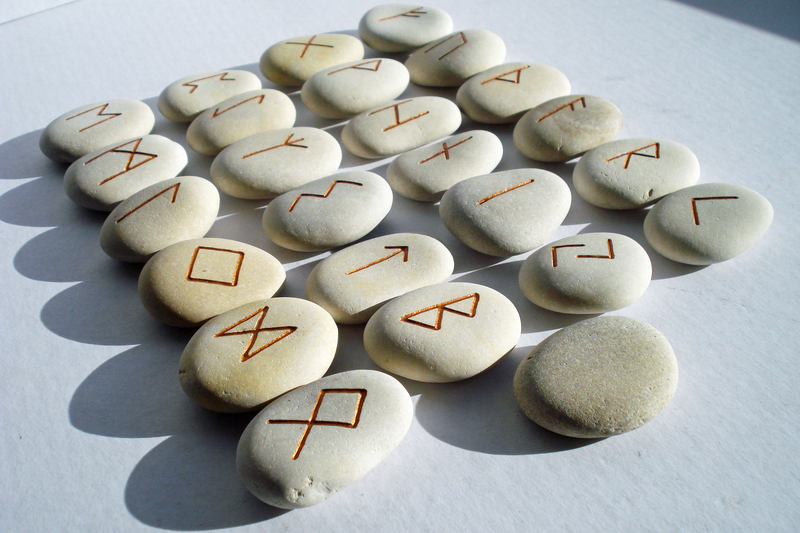 Click here to see my Elder Futhark Rune stones. 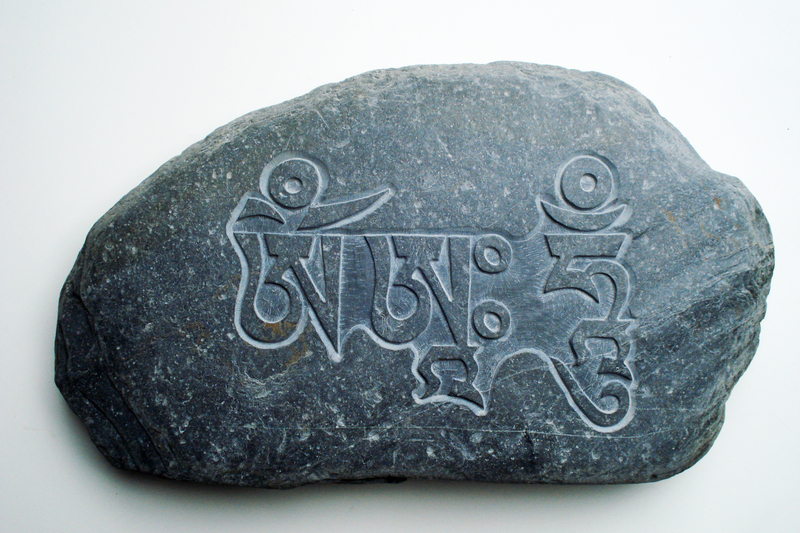 Hand carved in the Scottish Borders from natural Cornish beach stones. 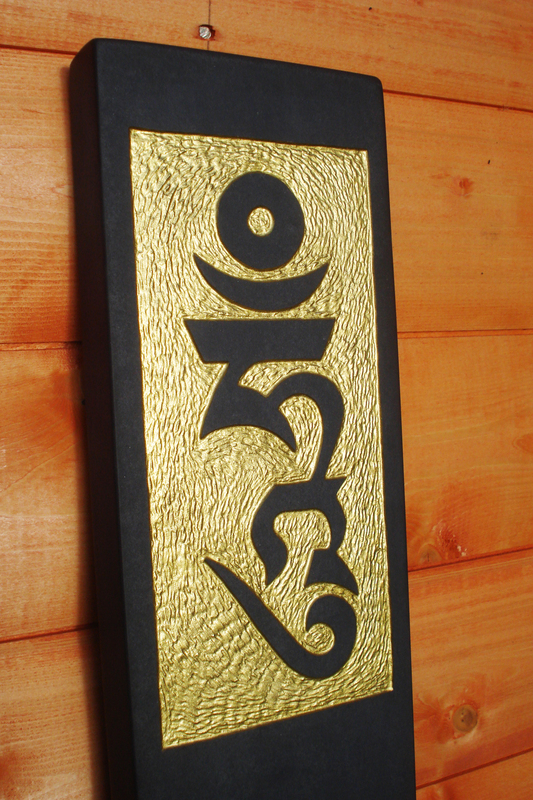 On sale at Kagyu Samye Dzong, London and also available to order direct from Hatch, Burn, Carve. 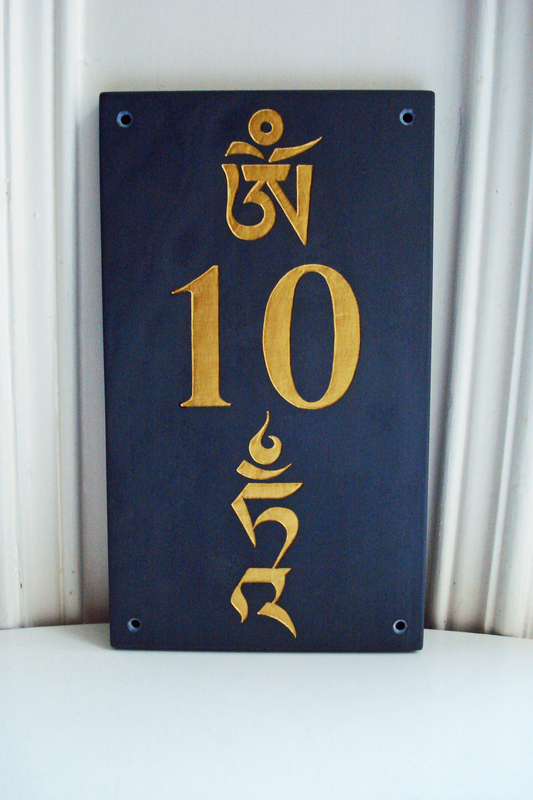 Tibetan Buddhist house sign (24 x 14 cm). 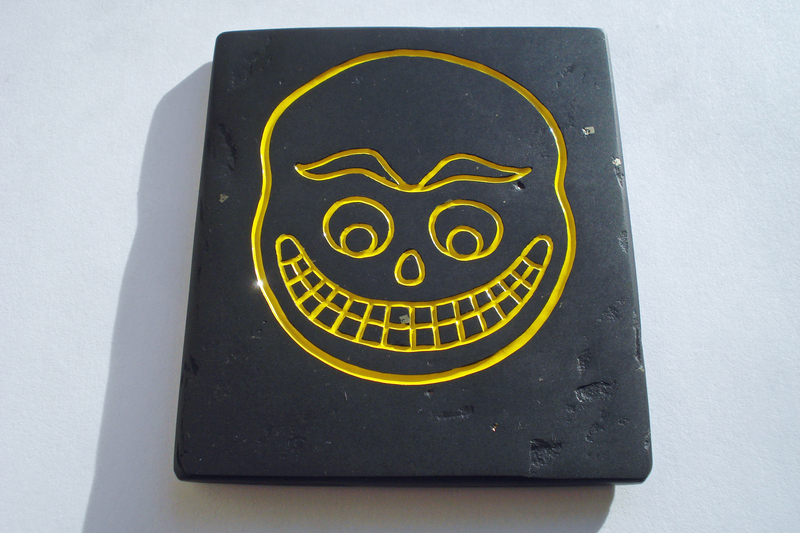 Hand cut, drilled and carved from 1 cm thick slate, and hand painted with gold enamel. 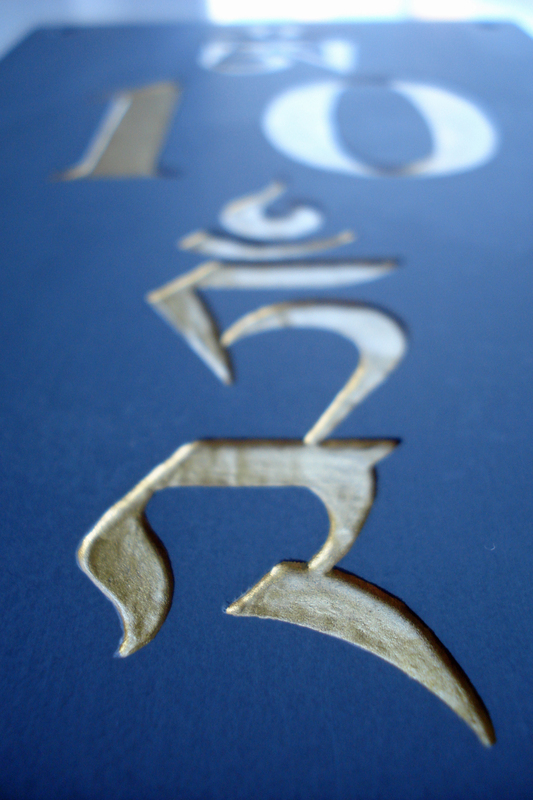 Tam syllable design used with kind permission from Tashi Mannox. 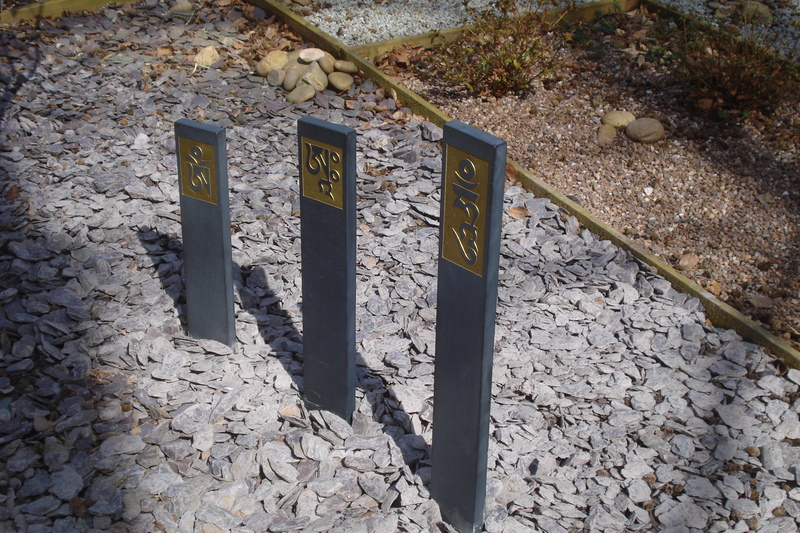 In 2017, I was commissioned to make three very special stones for a very special place. This place is Talliston House & Gardens, a three bedroom ex-council house in Essex which has been transformed over 25 years into a magical wonderland. 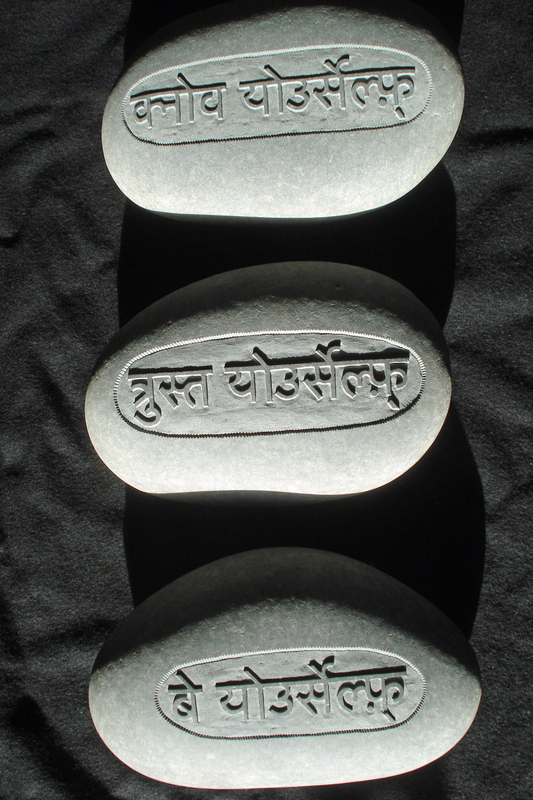 I was already making Talliston Talismans which are sold at the house and online (https://folksy.com/shops/Talliston/collections/254123-talliston-talismans), but last year I was asked to create these three Sanskrit stones for placement in San Phra Phum, the Cambodian Treehouse Sanctuary at the very top of Talliston. 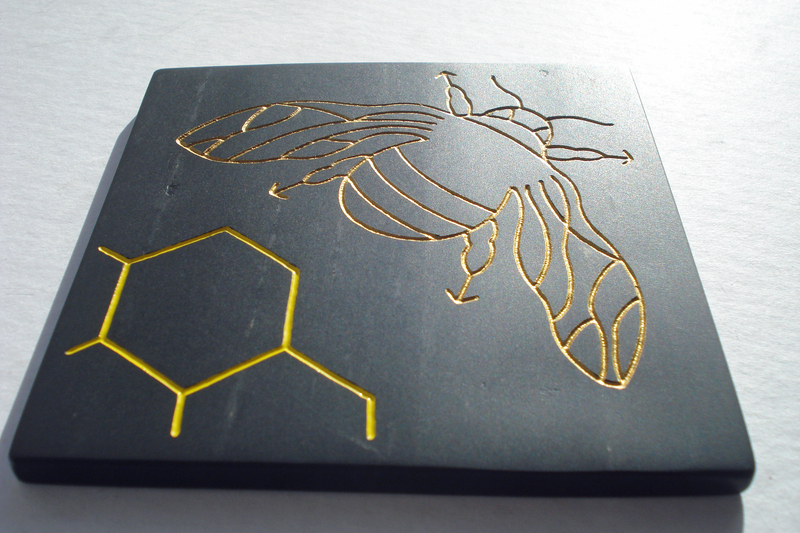 From start to finish, this was a process of liminality, of borders and thresholds. 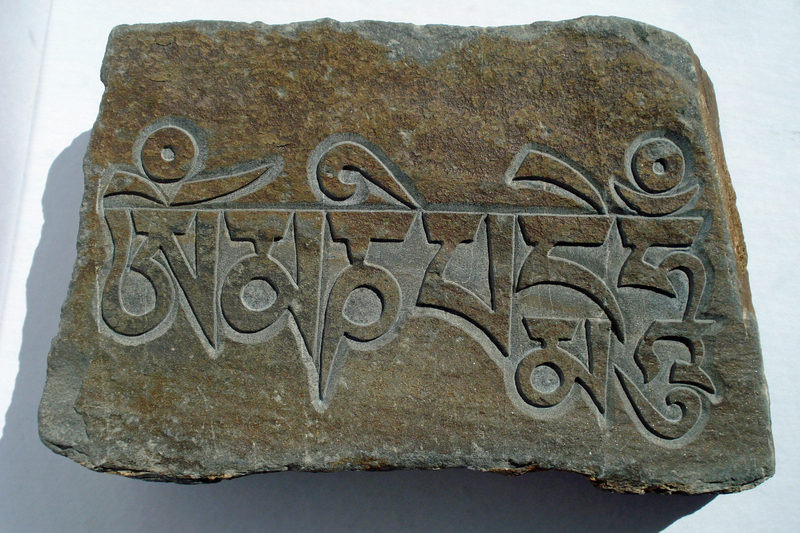 The stones I used were found on a day at the start of a new year. 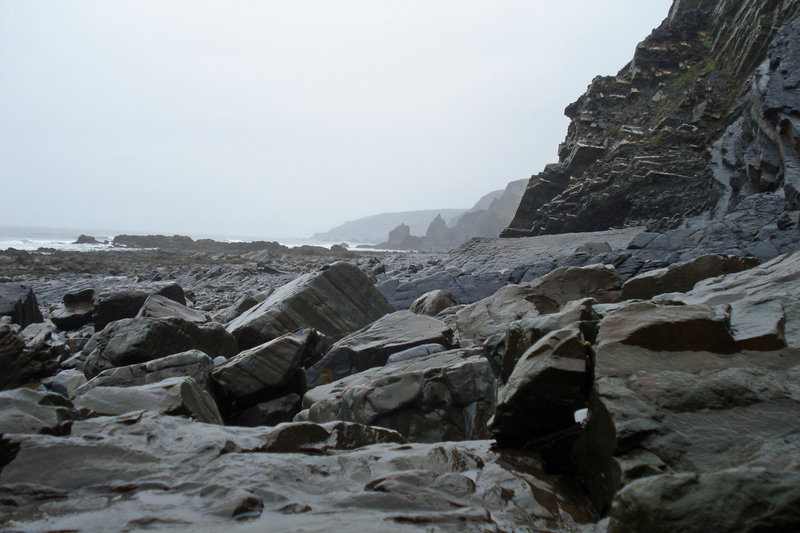 A day where mist clung to the land and there was no discernable distinction between the earth, sea and sky. 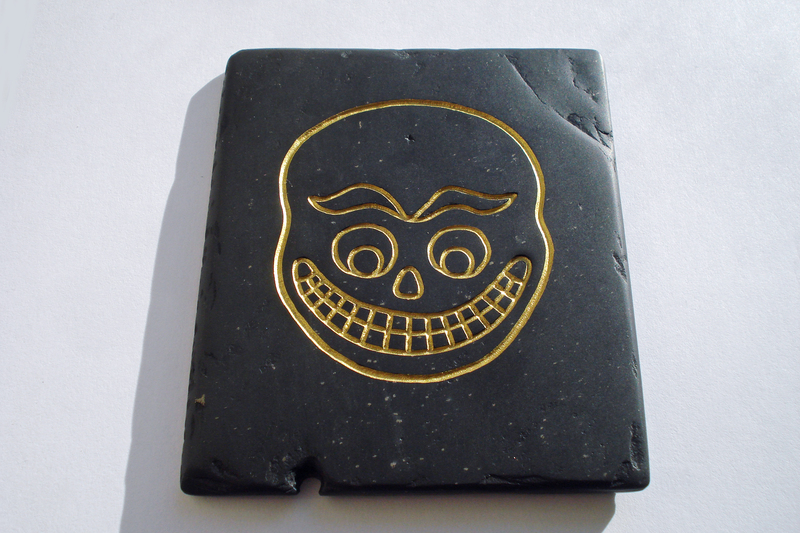 We headed to the ocean, to a beach near the Devon/Cornwall border and with the mantra ‘Know Thyself, Trust Thyself, Be Thyself’ turning over in my mind, I let my internal subconscious self override any expectation or longing to find the stones. 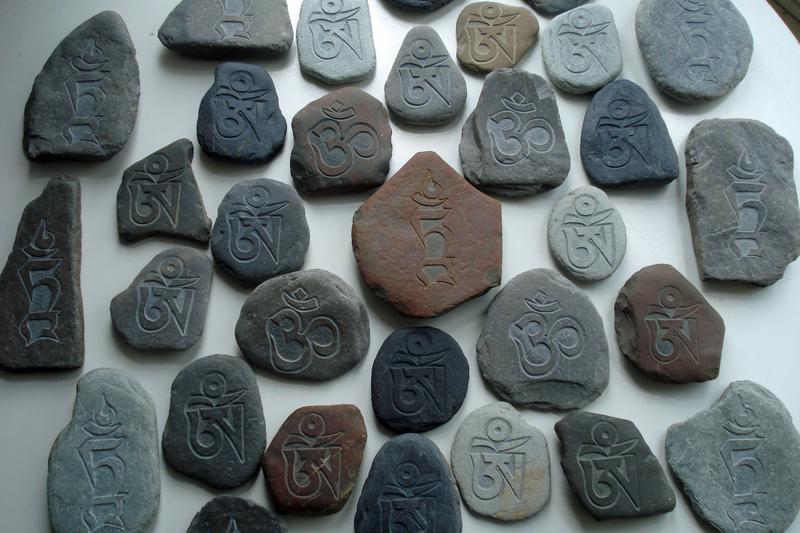 Connecting to the Genius Loci of the beach, the stones finally came to be in my hands. We left a gift and thanked this spirit of place. 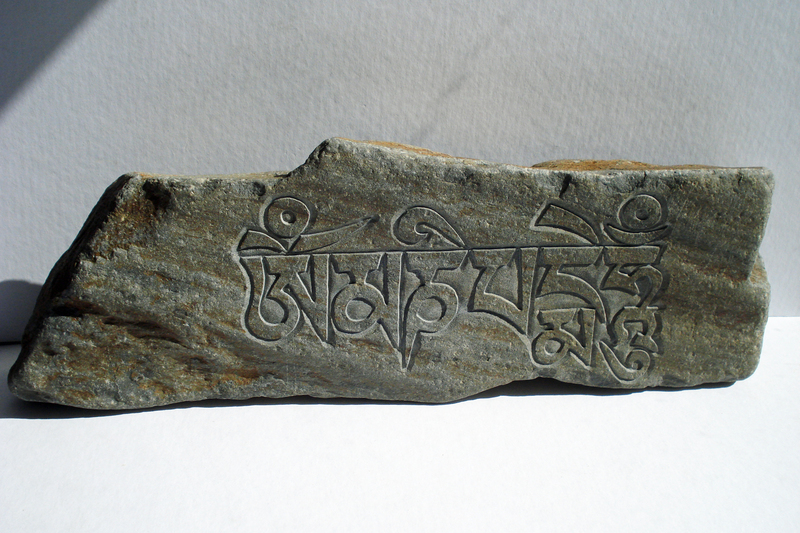 The stones travelled with me across the imaginary line separating England and Scotland. 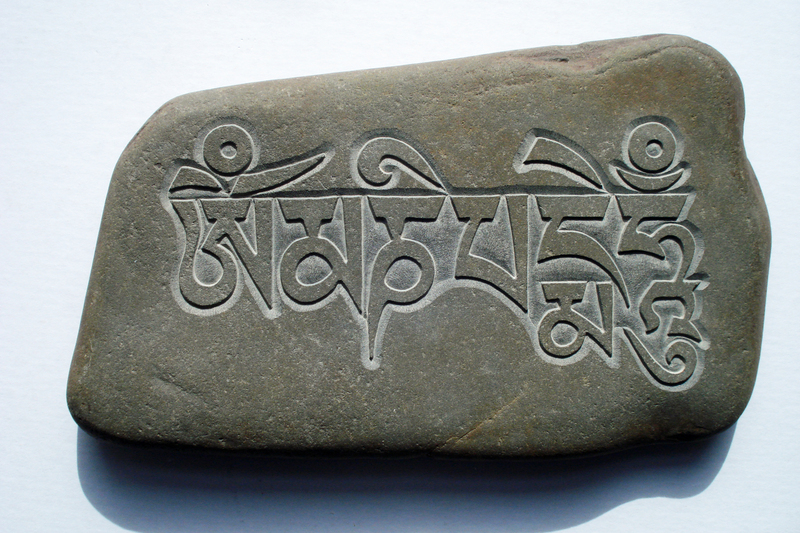 In my Scottish Borders workshop, I spent a number of days consumed in the process of creating the three stones, hand carving the Sanskrit outlines with diamond burrs and my Foredom power carver before using hammer and chisel to bring the mantras into relief. 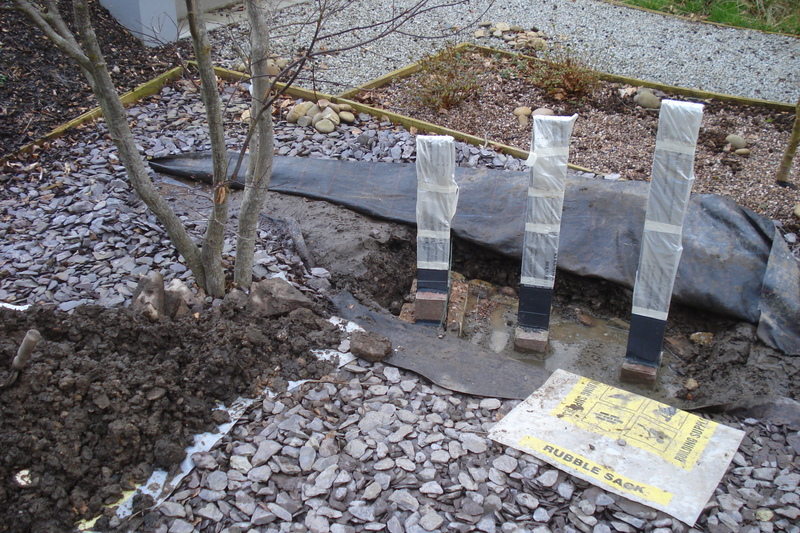 The stones complete, they travel with us once again, across country and county boundaries to their final destination within Talliston. We spend an amazing evening in the lovely company of John Trevillion and Marcus G J Cotton with a tour of Talliston House & Gardens, and some great food. 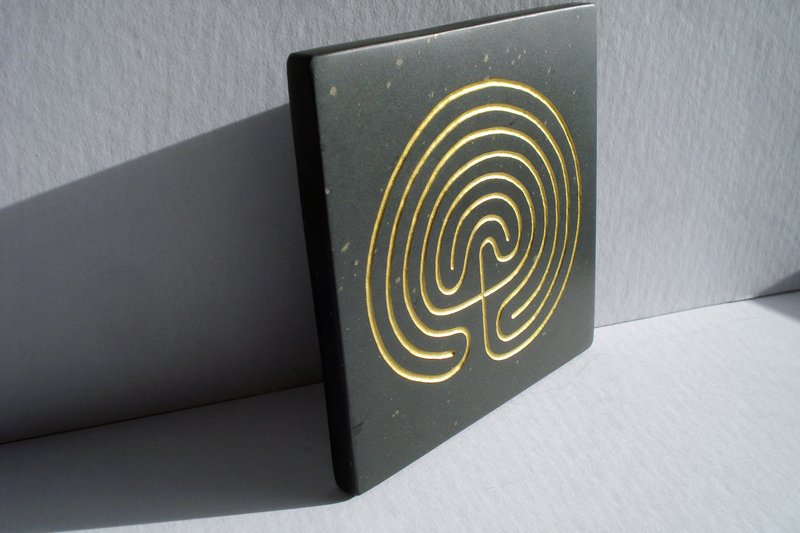 We climb a ladder from The Hall of Mirrors (Italy, 1992) into the Treehouse Sanctuary (Cambodia, 1965) and pass the stones up. 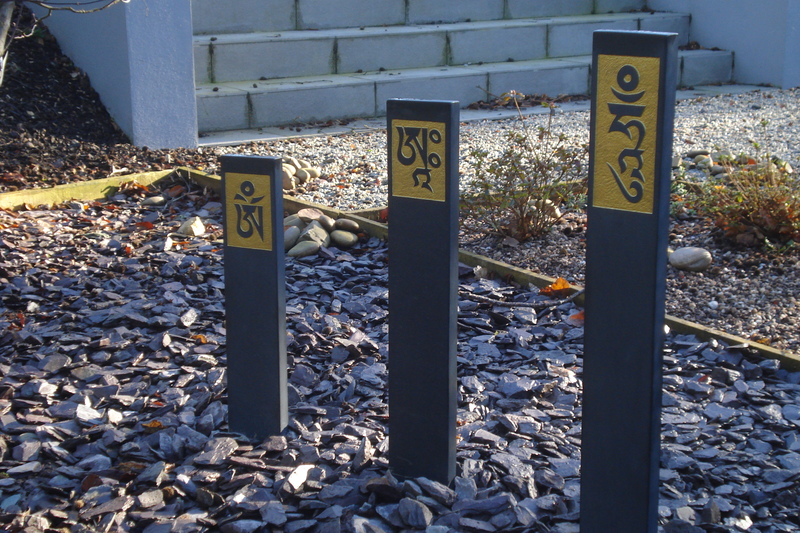 The stones are unwrapped and carefully placed in front of the Buddhist altar, finally in their rightful place after a journey of more than 1000 miles. 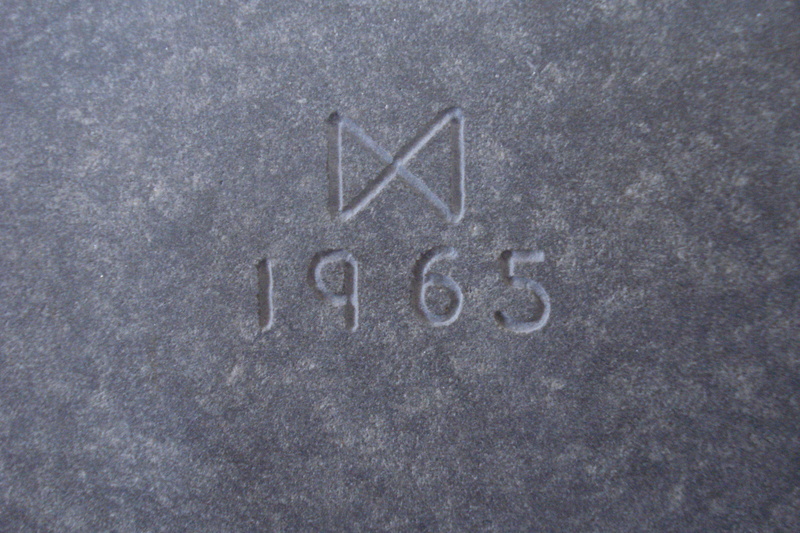 If you are lucky enough to visit ‘Britain’s Most Extraordinary Home’ and are permitted to handle the stones, you will see my makers mark on the reverse along with the year ‘1965’. 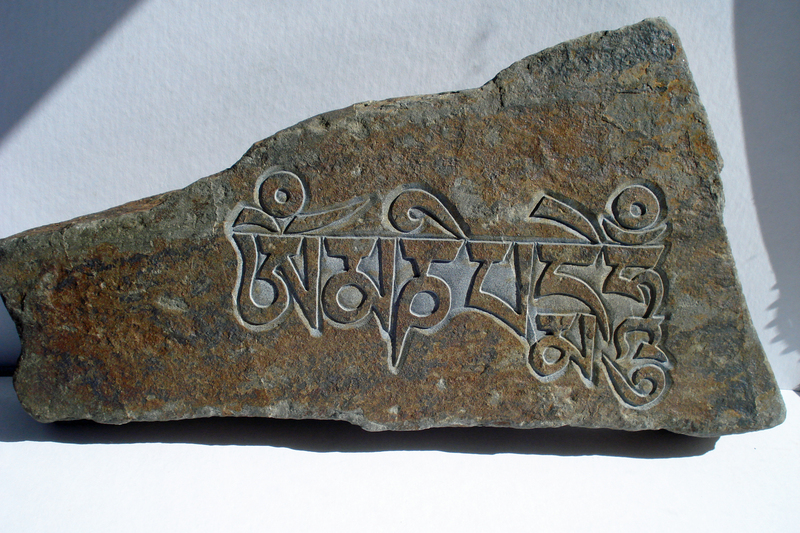 I carved these stones before I was born. 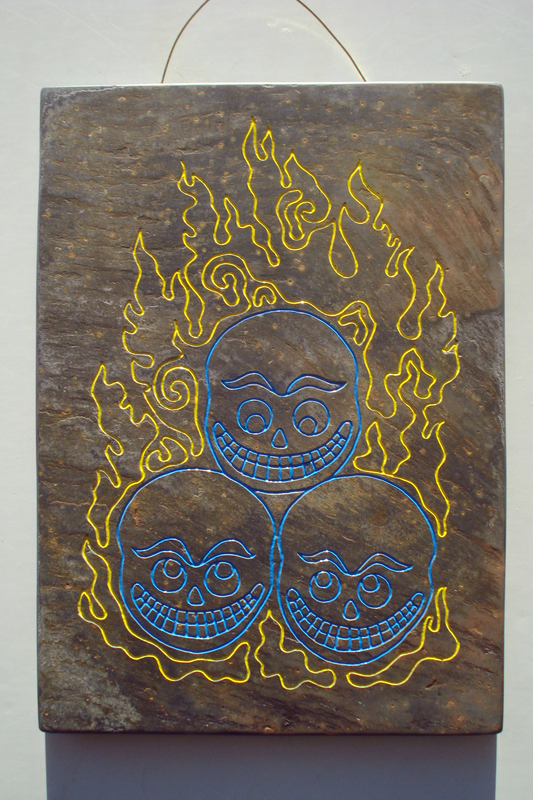 I based these skulls on a photograph of an ancient (and very worn) Tibetan Buddhist stone. 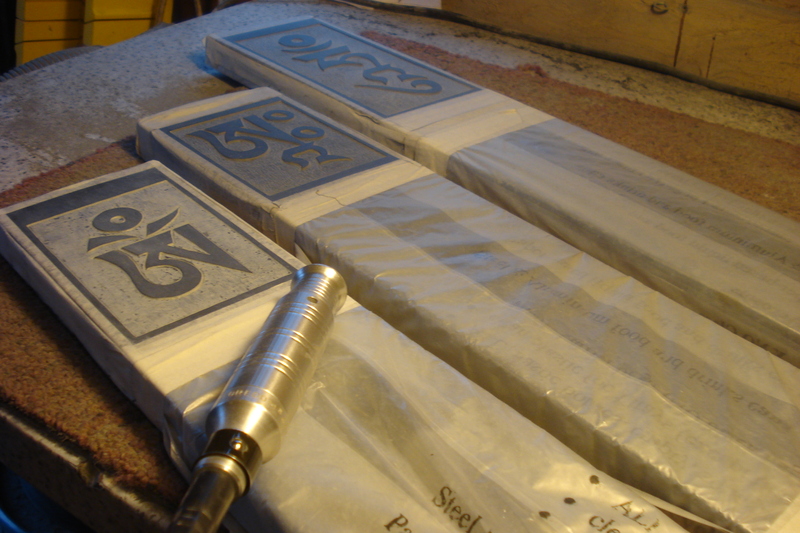 These are all freehand carved before sanding/polishing to 1200 grade. 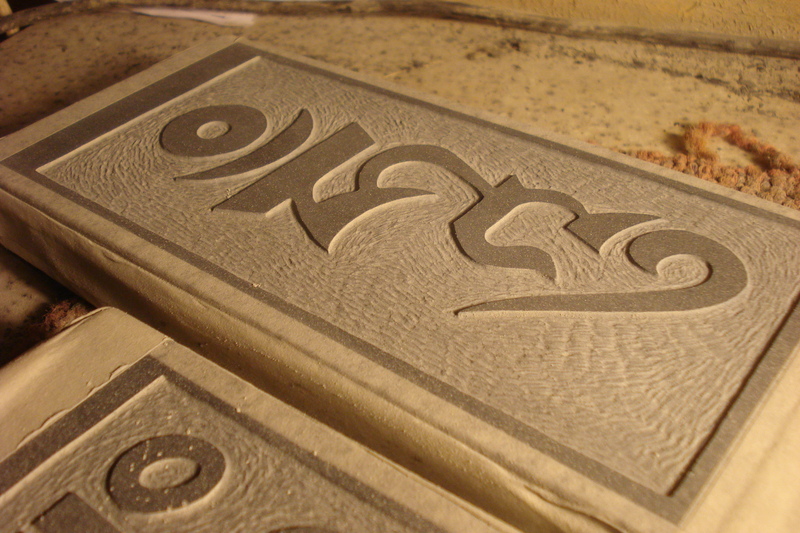 Enamelled with professional signwriters enamel before finishing with slate sheen. 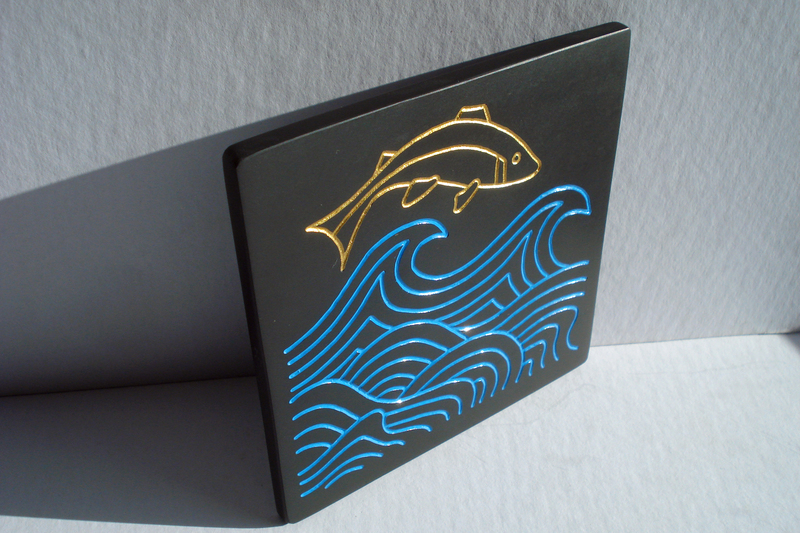 Sizes range from 7 x 10 cm to 9 x 10.5 cm. 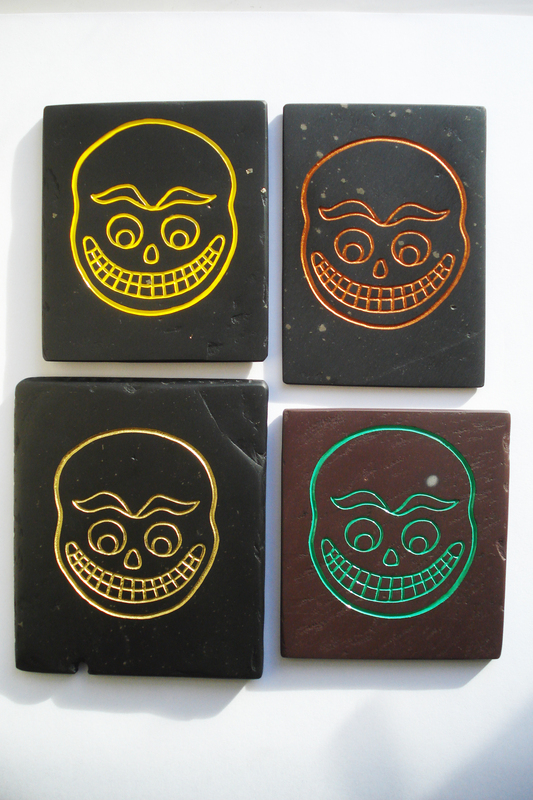 Available to buy now. 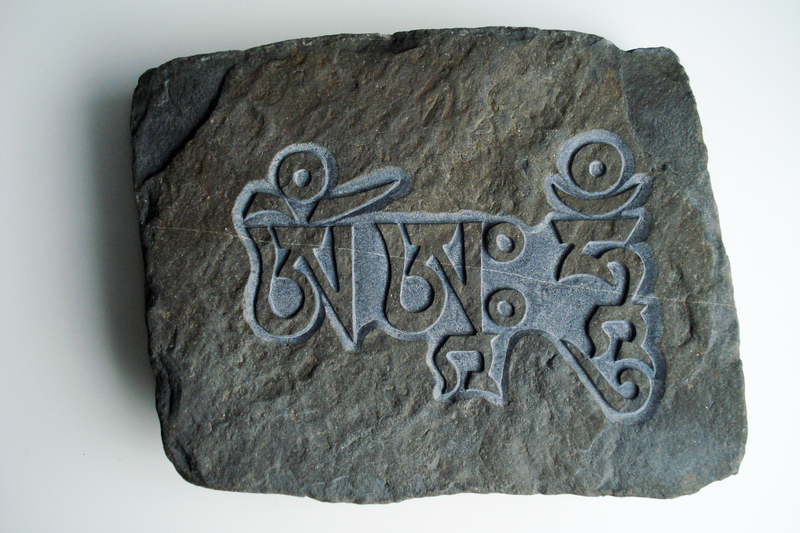 Carved from hand-cut reclaimed slates (24 x 17 cm), I based these designs on an ancient stone from a book about Tibetan carvings. 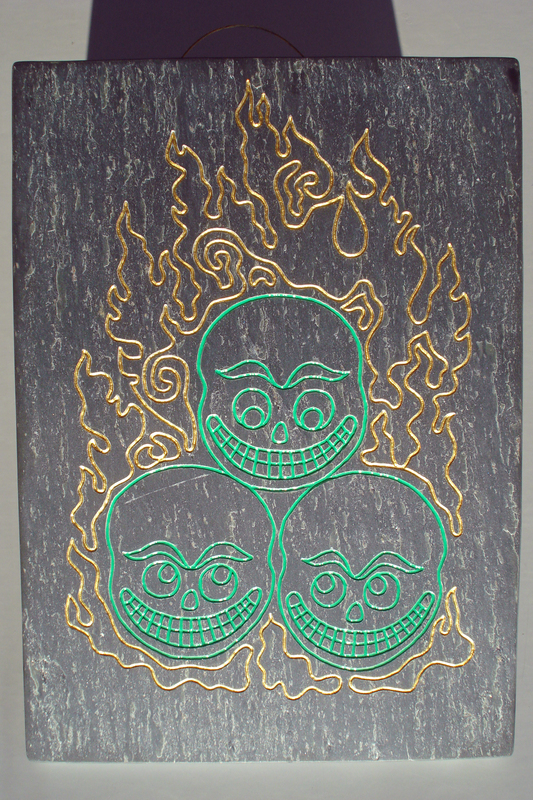 A commission I made during the summer of 2015. 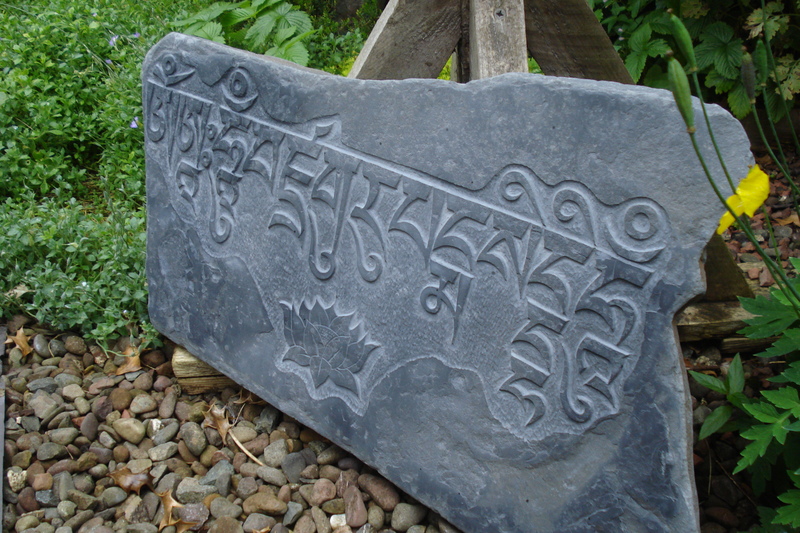 The 12 syllable Guru Rinpoche mantra (with my own lotus design) carved from a natural slate slab which was found at Sandy Mouth in North Cornwall (approx. 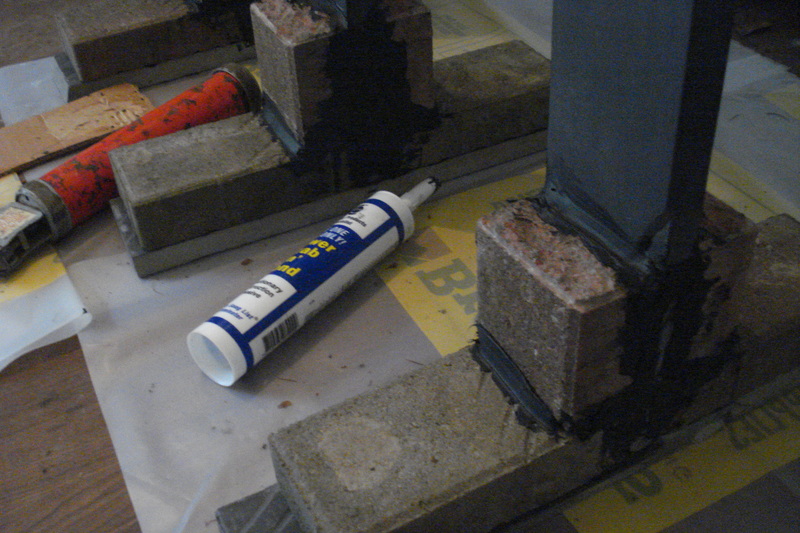 60 cm long). 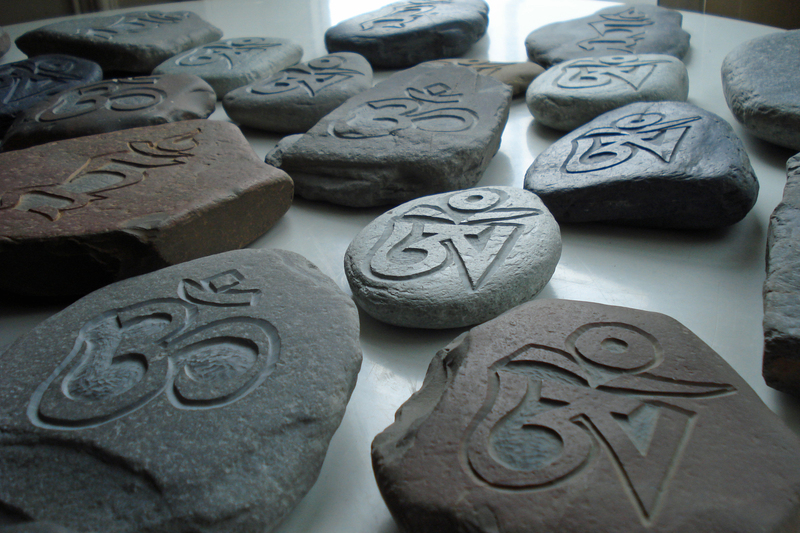 Some of the 50 Tibetan Om, Sanskrit Om and Tam stones recently carved and delivered to the shop at Samye Ling. 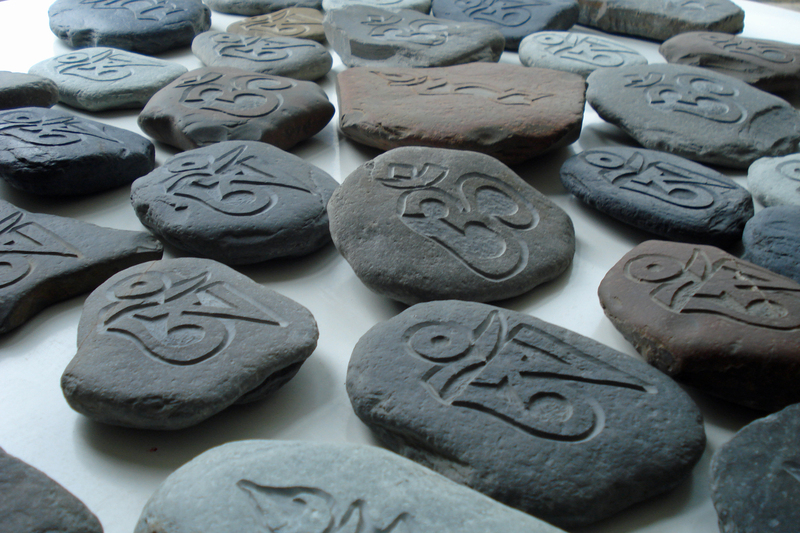 Each one individually hand carved from natural Cornish sea stones. 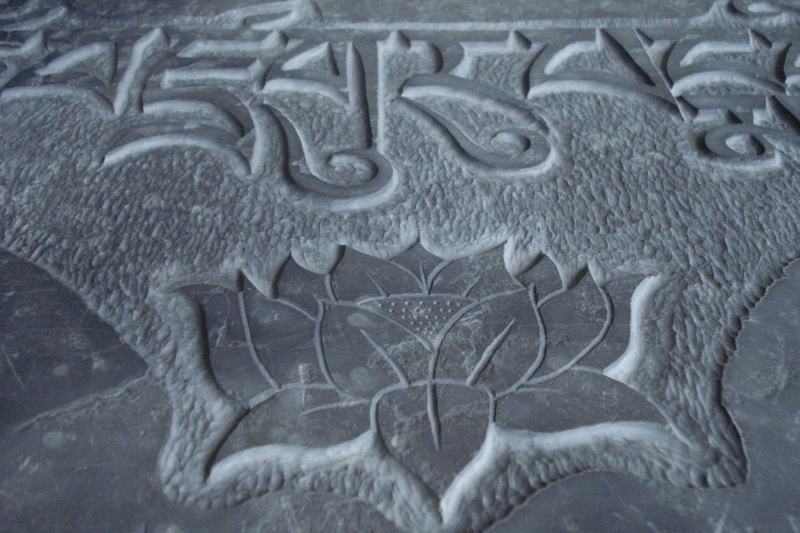 Tam syllable used with kind permission from Tashi Mannox.